BURGLARIES - May 20th - S. Odessa Ave.
Christina T. Catalano, 23, of Marlboro, NY, was arrested by Ofc. Scott Winneberger for DWI on May 19th. 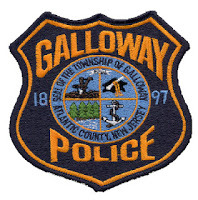 Rashawn S. David, 19, of Galloway, was arrested by Ofc. Przemyslaw Ryba for hindering apprehension and underage possession of alcohol on May 19. Arline R. Vickery-Williams, 64, of Galloway, was arrested by Ofc. Paul Smith for aggravated assault against Law Enforcement Officers, obstruction and threats on May 21. Donald J. Williams, 28, of Silver Springs, MD., was arrested by Ofc. Scott Winneberger for hindering apprehension on May 22. Alex Garcia-Perez, 26, of Ventnor was arrested by Ofc. William Kline for possession of less than 50 grams of marijuana on May 23. Edward L. Slatton IV, 27, of Atlantic City, was arrested by Ofc. Gary Brenner for possession of a weapon for unlawful purpose and criminal mischief on May 24. Daniel R. Ferguson, 21, of Absecon, was arrested by Of Det. Bryan Casey on two counts of possession of CDS; prescription pills and marijuana, on May 25.